Proteus NoEndo™ spin columns provide fast convenient affinity-based removal of endotoxins from antibodies and other proteins. These devices combine quality separations found in gravity columns with the speed of centrifugal separators. Using the unique FlowGo™ design, about 99% of endotoxins can be removed in a single pass through the agarose resin with protein recoveries of 85% or greater. High Capacity (HC) columns are available for recombinant proteins expressed from bacteria such as E. coli and Standard (S) columns are offered for purification of monoclonal antibodies from mammalian cells. NoEndo™ Mini kits are available with loose resin for samples up to 20 ml in volume. 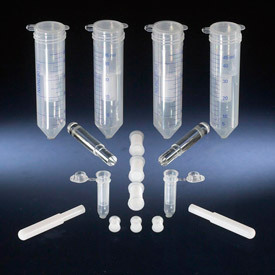 NoEndo™ Micro kits are also supplied with loose resin for small sample sizes.